I have thought for a while now about writing a series called kitchen basics so bear with me if this might be too basic for some of you. This all started at a friend's house after I saw him butcher an onion he was trying to chop and I realized that some basic tips and tricks around the kitchen might be helpful. 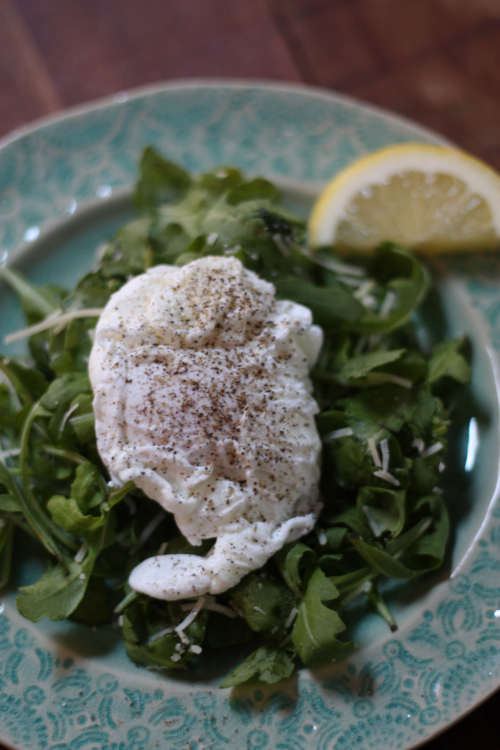 I didn't want to start the series with something as basic as chopping an onion, so I decided on something a little trickier and maybe less known — how to perfectly poach an egg. Start by getting the water to a rapid boil and add the vinegar. As stated in the ingredients list, you want a vessel to be able to slide the egg slowly into the boiling water, so a measuring cup was my choice. ** Please note I removed the pan from the heat for photography purposes. You would typically lower the egg while the pan was boiling and on the stove. The vinegar will help the white of the egg congeal and come together. Boil for 1 1/2 to 2 minutes. 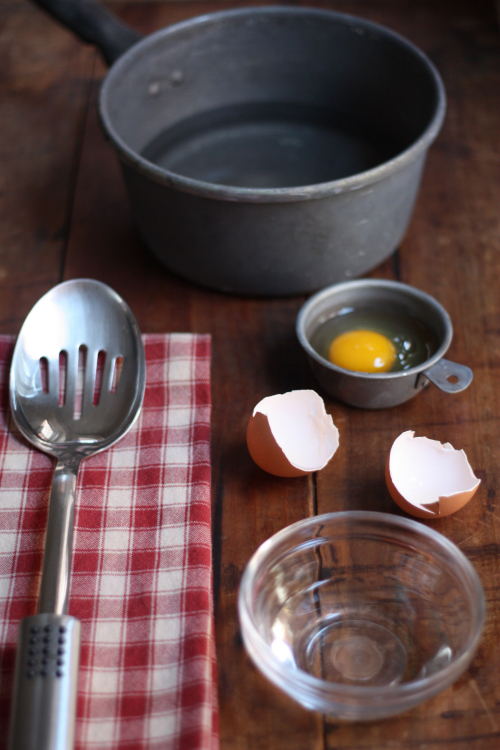 You want to remove the egg with a slotted spoon as this will help remove some of the water. 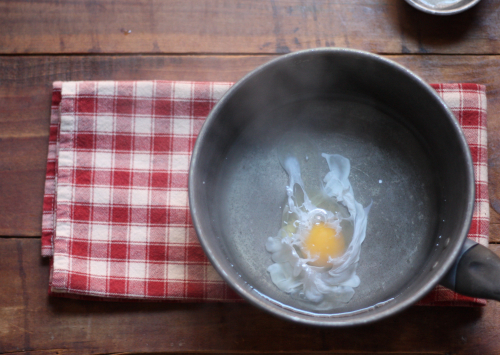 Gently rest the egg on your dish cloth and pat dry before plating. 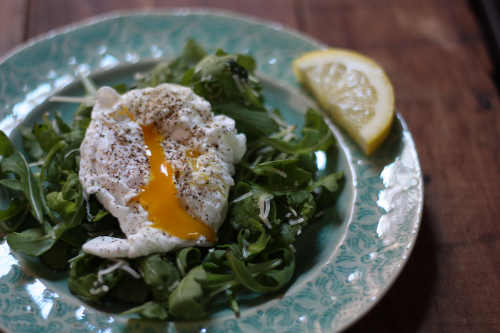 Place the egg on your greens (I choose arugula/parmesan with a little lemon and olive oil), adding salt and pepper to taste. 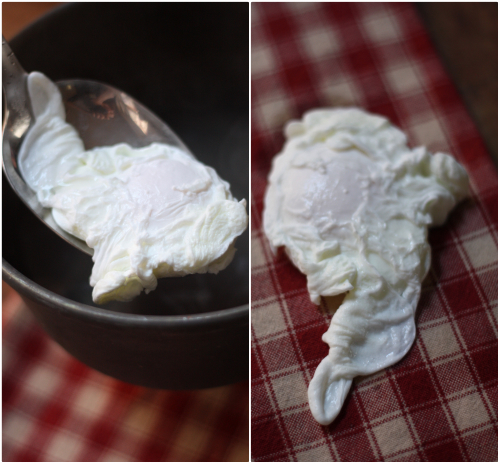 This method for poaching an egg might take a little practice but pretty soon you will perfect it, impressing your family and friends! 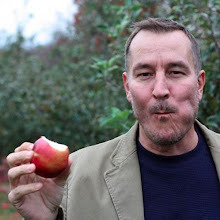 And in case you're wondering, yes, I will show how I dice an onion — you will just have to wait for that one! 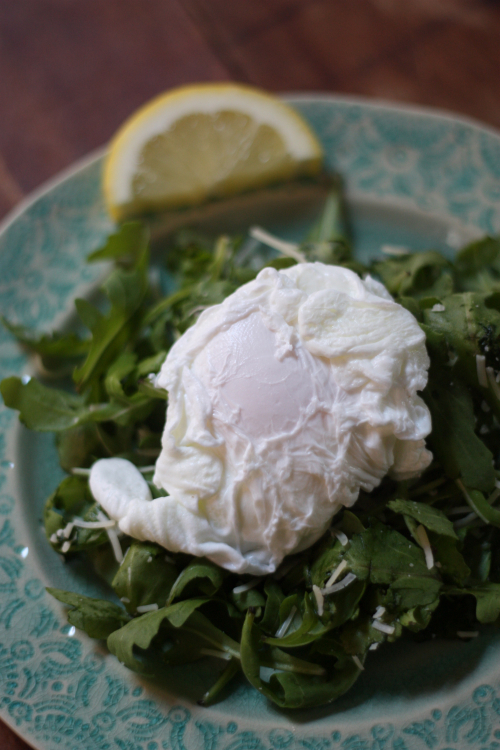 Hey sorry that is not a perfect poached egg! Hi Laura thanks for your comment. 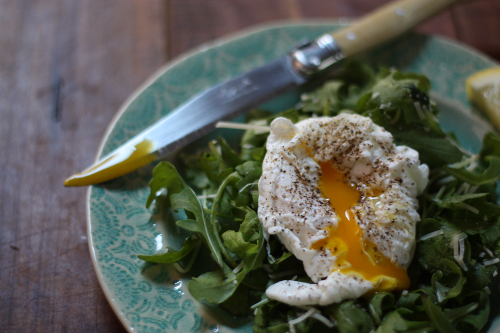 Would love to hear tips on how you make the perfect poached egg. I am always open for ideas and better ways to do things! Thanks for stopping by. It looks pretty darn good to me! This might sound silly, but I follow your blog and usually my brain can keep up with your posts. I struggle with poached eggs. In your instructions, are you REMOVING THE POT FROM HEAT before you slide the egg in? It looks that way in the pictures, but you don't say to do that in the text, so some clarification would be awesome. Thanks so much! Not silly at al and very observant. I will update the post with notes and I actually thought someone might ask. I actually removed it from the heat strictly to get a better photograph as the light over my stove is not great. So yes, you would typically leave it on the stove and add the egg while boiling. Thanks for asking and following along! I love your blogs and especially enjoy the beautiful layouts and pictures. I'm an experienced cook and had never run across poaching eggs this way. Tried it this morning; simple and delicious - brilliant really. Thank you for sharing. Thank you so much for the kind words and I am so happy this method worked for you! I love the idea of covering the basics! Saturday morning as I was flipping channels on the TV, I came across a cooking show geared for kids that absolutely butchered an onion. Sometimes the basics are the hardest things to do. Thanks Becky and Mary has been after me to do a series like this. Chopping an onion is definitely on the list! You can also use lemon juice esp. For a benedict!